Wow, my pals over at Tom Bihn bags just below the border from us are on the case big time (sorry, pun). Simply put, Tom Bihn makes the best bags in the world. If you’ve never seen one or had one, you’re missing out on one of life’s major pleasures. Unless you’ve been hiding under a rock or are otherwise pleasantly disconnected from the mass-media, you’ve probably heard about the new Apple laptop, the MacBook Air. Macaholics as we are here at TOM BIHN, we’ve already introduced a new size of our Brain Cell laptop case designed specifically for the MacBook Air. So all you MacAirHeads – go get ’em. You won’t be sorry. 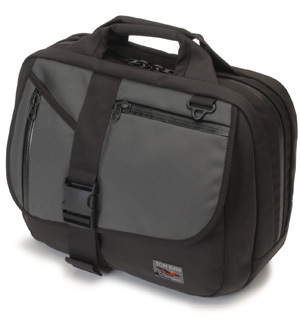 The TOM BIHN Brain Cell laptop case has gained a reputation for offering some of the best protection anyone can get for their laptop. Now the Brain Cell is available in a size specifically designed to carry the MacBook Air: Size 6X. The Brain Cell is designed to clip securely inside a wide variety of TOM BIHN messenger bags, briefcases, and backpacks — bags including the Empire Builder, Super Ego, ID, Ego, and Zephyr.